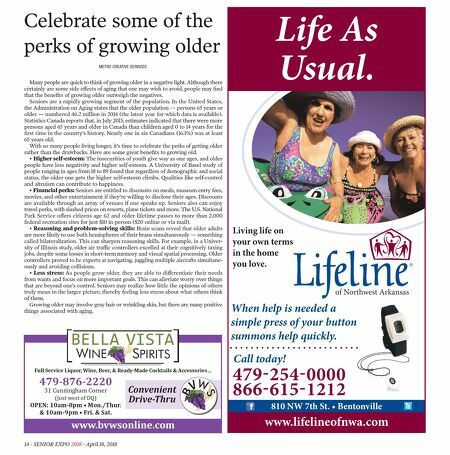 SENIOR EXPO 2018 - April 18, 2018 - 15 It's spring & your outdoor adventures are waiting for you! Find the best nature hikes, bike rides, fi shing & swimming holes, golf ranges, camping spots & more! 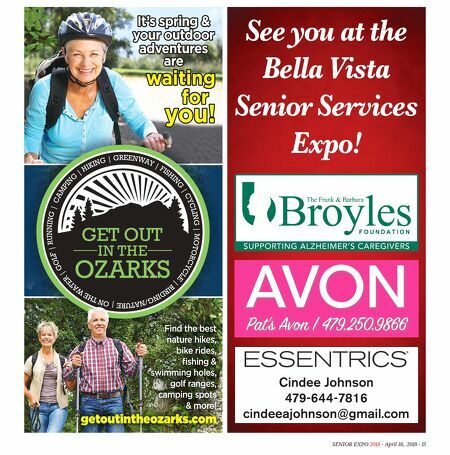 getoutintheozarks.com Cindee Johnson 479-644-7816 cindeeajohnson@gmail.com AVON Pat's Av | 479.250.9866 SUPPORTING ALZHEIMER'S CAREGIVERS See you at the Bella Vista Senior Services Expo!